Blood Moon University is the companion site to the UnDead Prom & Murder Mystery event that takes place in Los Angeles California. The site is designed to draw attendees into the UnDead World and truly become the UnDead Students that they become at the UnDead Prom. The site provides a variety of information about the factious school so that individuals can have a base to build their own UnDead Characters from. The site is also designed to provided clues to the Murder Mystery that takes place in the UnDead Prom. The Campus Life section is a blog that shares clues and other school related information throughout the year not just the month before the UnDead Prom. Clues directly related to the Murder Mystery are provided frequently the month before the UnDead Prom. Throughout the rest of the year, anyone who submits an UnDead Student Character could be mentioned in Campus Life. 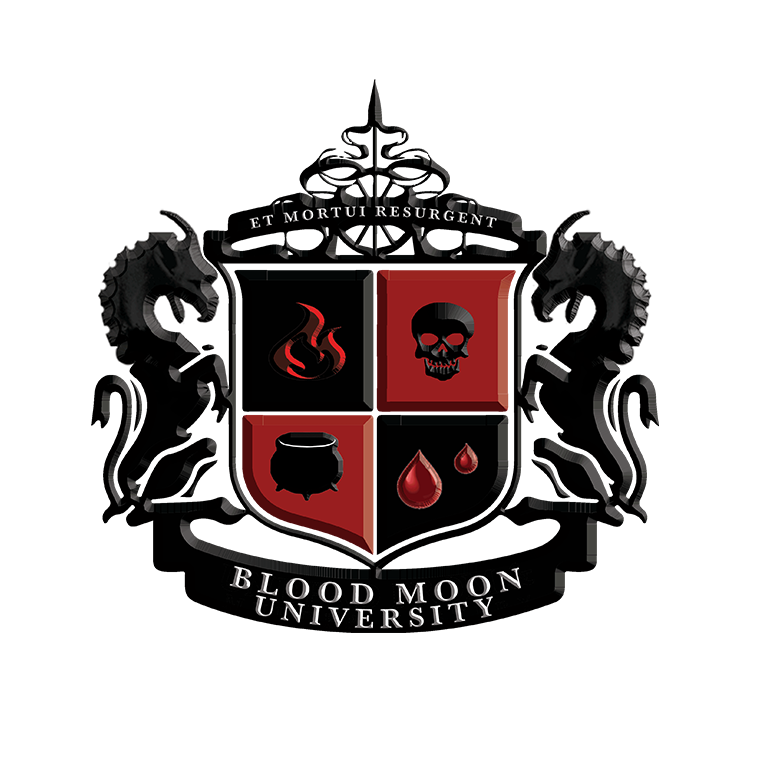 Blood Moon University is not limited to those living in the Los Angeles area or those attending the UnDead Prom. Everyone is invited to become UnDead Students and connect with other individuals interested in being students at Blood Moon University. The site will grow and expand as more individuals visit and become active with the site and associated social media pages. Those interested in becoming UnDead Students are asked to complete the UnDead Student Application Form along with signing up for the UnDead Student Newsletter. The school crest was designed by Rhiannon "Nikki" McFarling and created by Master Website Designers. There were 8 versions of the logo as it went from the basic design idea that Nikki had and then transformed into the School Crest that is used today. The graphic designer at Master Website Designers was the person who gave the school its motto "Et Mortui Resurgent" which means "And the Dead Shall be Raised". There are two colors used on the crest black and red. Those are the official school colors which represent life and death. Red for the blood of life and black as the end of life. The crest is protected by the school mascot the Hell Hound. The Hell Hound is loyal and is a strong protector of its domain. Inside the crest is four icons, Fire, Skull, Cauldron, & Blood. They have different meanings to the UnDead that attend Blood Moon University and after much determination Blood Moon university decided to allow those symbols to represent each student as they feel without limiting the meanings. Blood Moon University is a very diverse school that accepts all types of UnDead Students from different devisions within their own kind.